Andy Thomas was the hereditary chief of the Esquimalt First Nation. The Nuu-chah-nulth Tribal Council has offered support and condolences to the family of the late Esquimalt First Nation Chief Andy Thomas. Thomas passed away suddenly on April 7, taking the Victoria community by shock. As recently as March 20, the much-respected leader took part in the unveiling of new downtown signs that featured place names from Lekwungen territory. "I have known Chief Andy Thomas for many years," NTC President Judith Sayers told Ha-Shilth-sa Thursday. "He was the epitome of a true leader that looked after his people, thought of other people before himself and loved his culture by living it every day. His loss is a big one in our hearts." An April 12 news release signed by Sayers and NTC Vice-President Andy Callicum expressed their sorrow. 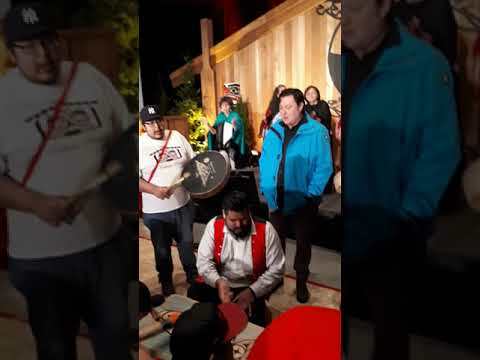 “To Chief Andy Thomas’ wife, children and grandchildren, family, Esquimalt Nation and community: We would like to let you know that the Nuu-chah-nulth people mourn with you during this time of great loss. “Chief Andy Thomas was a very well-respected person, and held high amongst First Nations leaders. He was a great supporter of First Nations people, no matter where they came from, and was someone who opened his longhouse and community to all. He was knowledgeable in culture and protocol, and was generous in sharing that knowledge with others,” said the statement. On Wednesday, the members of the View Royal Fire Department and the RCMP lined the streets for the procession carrying the late chief's remains. A funeral was to be held Thursday. Seenupin, 70, served as hereditary chief of Esquimalt First Nation for 47 years, and was instrumental in the creation of the Assembly of First Nations. Thomas was a leader in the long-standing court battle to make Ottawa live up to the terms of treaties that were signed by his community in the 19th century. That team included the Union of B.C. Indian Chiefs and the First Nations of South Island Tribal Council. "Chief Andy" was also a major proponent of various economic development initiatives through the Kasapsum Development Corp. Those include West Bay Marina in Esquimalt, which developed in partnership with Songhees First Nation. Thomas was instrumental in promoting First Nations language and culture in the Victoria School District, and was a leader in creating a path towards reconciliation. In 2007, he was honoured with the Chancellor's Community Recognition by Royal Roads University. The NTC statement acknowledged Thomas’ working relationship with Nuu-chah-nulth. “Chief Andy was a champion for his people and their rights,” said the April 12 release. “The Nuu-chah-nulth people will remember Chief Andy for his leadership, generosity and willingness to share with other First Nations. He had many familial and political connections with Nuu-chah-nulth and made us feel we were part of his community regardless of where we visited within his territory.